Under the Big Oak Tree: Friday's Fave Five: November 6th. I needed to skip last week's Fave Five partly because it's been taking me a while to get back into the swing of things after the baby and I were sick and partly because after being stuck in the house for a week and a half, I didn't have anything to post about. It was a really quiet week! I'm really happy to be posting my Friday's Fave Five this week, hoping things will get back to normal again soon! We're better! Swine flu has left our house! Thank goodness! And it left us just in time for Halloween! Aside from Grace being a bit clingy lately, we're both feeling much better! Blog Friends. I'm really enjoying blogging. I just wish I could find more time to devote to it. In just the few months that I've been doing this, I've gained some new friends and it makes me very happy! Loving the cool weather. I love autumn. The cool weather is so much nicer than the hot, sweaty summer. At night, while I watch TV, I am often snuggled on the recliner with both the baby and the dog on my lap. Soon, it will be time to have a fire burning in the fireplace and Remmy will constantly be whining for me to snuggle with her next to the fire. Grace's first Halloween. I am so thankful that we were both over the Swine Flu in time for Halloween. 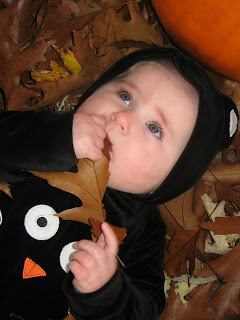 I would have been really bummed if we were stuck home for the baby's first Halloween! It was a really great day and was so nice to finally get out of the house for something other than a doctor's appointment! We dressed her up and took her to my parents' house for a little Halloween party and then took her to see her aunt and uncle for a little visit. Wednesday, I posted pictures of her in her Lady Bug costume, you can see them here. I also took some pictures of her in a little black cat costume that someone handed down to me. Isn't she so cute?! To read more about what made others happy this week, check out Friday's Fave Five hosted by Susanne at Living to Tell the Story. That little costume is darling. I'm glad you're both feeling better. The family times sounds fun! Glad to hear you are better. The swine flu has really been making its rounds. But no more for you! Family nights are very special. Have as many as you can. What a time you have had! I am so happy to hear you are both feeling better! I agree with the cooler weather..it really is such a cozy time! So glad to hear you guys are feeling better now! What an adorable picture! I'm always amazed at the friendships that have developed from blogging. If someone had told me that 10 years ago I would have said they were crazy! 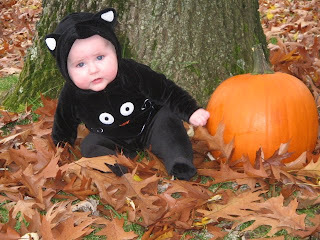 I love the pictures of Grace with the pumpkin, very cute. I love blogging and reading blogs too, and it seems like there is never enough time! What sweet photos of your little girl! I agree with the blogging friends~ blogging has brought me so much joy and so many friends from all over the world!